Precise Portions Show ‘N Tell Nutrition Learning System portion control plates -Pack 4 in Spanish. Whether you are teaching healthy eating to students whose primary language is Spanish or wanting to teach Spanish words to children who don’t speak Spanish, this four pack of 4 Nutrition Learning System Plates for Kids in Spanish with 1 Lid is just the answer you need. Smart meal choices aren’t made exclusively at home. 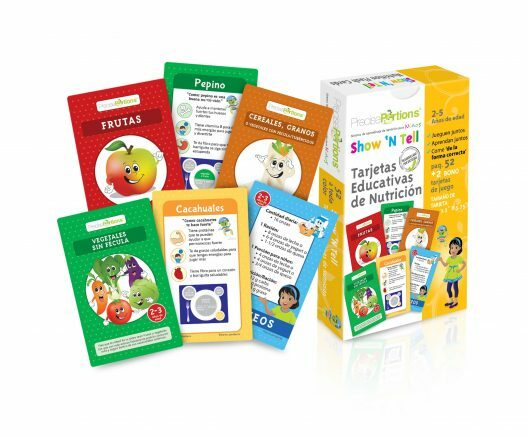 Give little ones the gift of easy healthy choices wherever they are with the Travel Plates with Lids in Spanish. Portable: take it anywhere you go! Even better, the bright and engaging colors make sure they’ll have fun while doing so! Adults will love the convenience of a child-sized spoon and fork contained right in the lid and the ability it gives them to easily save leftovers. Each plate comes illustrated with friendly depictions of cartoon foods with encouraging messages that celebrate eating a well-balanced meal. Ideal for use both in the classroom and at home, particularly for children whose families may not be native English speakers or are seeking to acquire Spanish as a second language. The need for healthy eating habits goes beyond culture, language and age. Use these plates to start a lifetime of healthy eating habits with all toddlers. It’s been scientifically proven that controlling your portions will help you lose weight naturally and stay healthy. Our nutrition control systems are designed for the whole family, and will help your children develop healthy eating habits that they’ll remember for life. 3rd party independent clinical trial data shows, Precise Portions tools work. © 2019 Precise Portions ®.